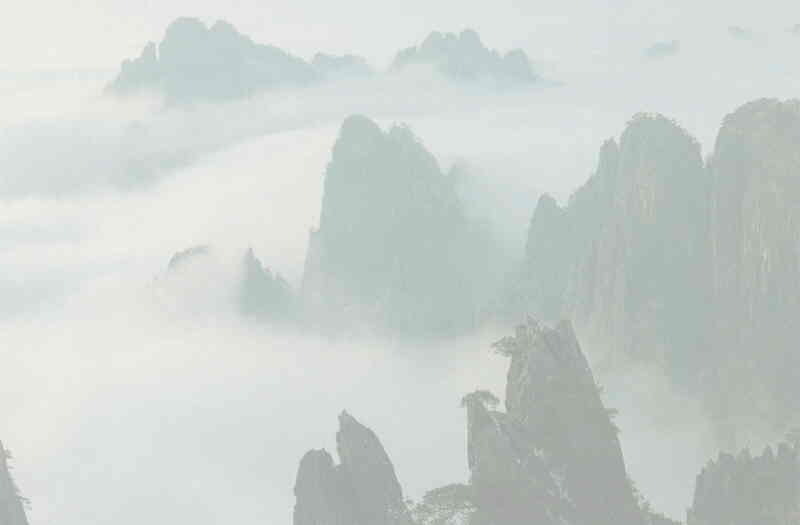 The two lines from a carefree and leisurely ancient poem create images of its lingering charm of over 1,000 years ago, on the White Cloud Mountain, in the cold winter, echoing in the fine drizzle of January on the Lunar Calendar, and permeating into its misty and foggy chill. We drove along the spiral road in the forest. The green trees on both sides delighted our eye, enhancing the quiet and secluded woods. The bamboo groves were thick, tall and erect. Exotic and fragrant flowers danced in the refreshing breeze. Our eyes feasted on the panoramic view of the enchanting mountain scene. The car wound its way upwards. On a piece of treasured land towers aloft a temple – Neng Ren Temple, circled by trees and with the beautiful mountain in the background. Nearby stood a stone tablet inscribed with four Chinese characters “Wu Chen Jing Jie” (literally No Dust State). Visitors were few, making the forest more secluded and the temple cleaner and more tranquil. The pure land was originally unpolluted, without any dust - so should be people’s minds. When their hearts are free from any attachments, the dust can then vanish and thus they are able to see the True Nature of Suchness. The stone stairs led us to the sublime and towering halls, the Main Hall, the Vajra Dharmadhatu Hall and the Hall of the Sixth Patriarch. Shakyamuni Buddha, with the greatest compassion and loving-kindness, took pity on the worldly people. His hallmarks are perfect and dignified. With utmost sincerity, we paid obeisance to the Buddha images. Suddenly it started to rain. What Dharma rain! All Tathagatas started their practice at the causal stage. By realizing the perfect, pure, internal illumination, they sever ignorance forever. Since time without beginning, all sentient beings have been misled by various kinds of distorted dreams. Because their true nature is veiled, they cling to all kinds of attachments. The illusive mirages formed by the Six Dusts (Six Defilements) cover their true nature like dust. Thus, led by the Karmic obstructions, they transmigrate in the bitter sea of birth and death running ceaselessly. Only after they break free from their ignorance can they reach the unsurpassable supreme Dharma Realm and attain the perfect wisdom. Having left the pure land behind us, we arrived at the special place for birds with nets above and snares below. Many varieties of birds were caged in a huge iron net. They chirped and flew happily in the confined space, sometimes staying still for a long time, and sometimes fluttering their wings while strolling. In thousands of different forms, they hovered in the sky. Not knowing the great joy they brought to others or the Karma of incarnation that binds them in the same net, they were carefree, still searching for food and playing in the chilly mist of winter. In the middle of the net was a pool of crystal clear water, with several white swans swimming gracefully in it. The statues in the water were so lifelike and full of vitality. Some naï bve children sat around a weather-beaten man with a long beard. Occasionally, white doves came and perched on their heads. All of a sudden, the peaceful scene was filled with life, gentleness and quietude, beautiful and harmonious, enriching the soft verdant grasslands. The grass and leaves were clean, luxuriant and beautiful, as if the fine drizzles from the sky had just washed them. When one’s heart is serene, he feels that the mountain is empty and when birds chirp, the flowers are even more tranquil. In front of the quiet pond, we performed the Buddhist ceremony of salvation for the birds. Our wish was for them to take refuge in the Three Gems and to be reborn in Buddha’s Pure Land. The water sometimes rippled and sometimes became still. Perhaps these birds had some connection with us in our previous lives, so that we could experience this miraculous encounter in this life. I was delighted to receive your letter and gratified at your progress in Buddhism practice. Maha Acarya Feng Da An once gave me an instruction. It quotes: “The Wise Elderly Subhuti (who was actually the incarnate of a Buddha) was also called as “Emptiness Upon Birth” because everything in his room was transformed into emptiness the moment he was born, and the room was illuminated with pure light This phenomenon is Transforming Forms into True Nature, also described by the Sixth Patriarch of the Ch’an School as the state Non-form as the Basis. The Wise Elderly Subhuti had another name ‘Wonderful Manifestation’. He was so called because he had broken free from all the ignorance and obstacles. He realized the Equality Wisdom and merged into oneness with the Ratna Division so that sublime and wonderful forms could be manifested. As he reached the state of Buddha Ratnasambhava, the Diamond Sutra turned into his own language. Therefore, it was Subhuti who requested the Buddha to expound on the subtle, profound and wonderful purport of the sutra. Your letter reads: “When I practice the Maha Cakra Vajra (Big Wheel Vajra) Mantra, I see lights shining in front of me. From time to time, I feel that my physical body and everything around me no longer exist. I am enveloped in a round space and bathed by strong lights.” The internal state described above is a true internal realization if you reach it in practice when you are both physically and mentally healthy, when your consciousness is subdued and when you achieve it in the state of complete tranquility and brightness in Samadhi. If you have this experience when you practice the mantra in a state of physical fatigue and mental exhaustion or confusion, this is false realization You shouldn’t be proud nor should you indulge in it. Even the true achievement can change, coming and going from time to time, so you should not abide in it either. You must keep on practising hard and should never tire of trying to make even further progress. Only in this way can you achieve the two states “Emptiness upon Birth” and “Wonderful Manifestation”. Then your great achievements in the practice of Buddhism can benefit sentient beings when the appropriate conditions arise. The Vidyarajas are powerful and wrathful deities who help sentient beings break off their Karmic obstructions. Acala Vidyaraja is always portrayed as sitting on a triangle-shaped stone bench, with a sword in the right hand and a coiled rope in the left hand. His bulging eyes burn with rage, and the blue body radiates fierce flames. He is indeed powerful and terrifying! The third layer the Fire Cakra (Fire Wheel) of the Five Cakra Stupa (Five Wheel Pagoda) of the Esoteric School is transformed into a triangle cone in red. By now you can understand the esoteric meaning of the reverse triangle which you saw in your practice. One can have true effect when he practices the Sadhana with great energy. When it is midnight, one can easily get tired and unable to think clearly. The result of his meditation would not be good. If he is exhausted, he should stop his practice at once and take a good rest. In this way, he can avoid doing it badly. Your article entitled “Clouds Floating in the Blue Sky and Water Kept in the Bottle” touches many people. Luo Xiao Wen, who graduated from Zhong Shan Medical University, commented on your article, saying: “Just like the birds in a big cage, mundane people lead a muddled life. Her article would be thought-provoking if she could make the association between the birds and the people who are deluded.” You can decide if her suggestion is a good idea. Thank you very much for the book on Samaya Sila that you mailed to us. My sister Hui Cong and I studied the book carefully and discussed the contents. We encourage and support each other in the path of Buddhism practice. We are deeply touched by your loving-kindness and great compassion. No better words can express our heart-felt gratitude to you- my Guru. Human life is only a short stop on a long journey. The most beautiful time in one’s life is always the most hectic. What people persist in seeking are nothing but floating smoke, passing clouds, daydreams, illusions and bubbles. Boundless is the sea of bitterness, yet a man who truly repents can reach the shore nearby. One’s life is controlled by the natural law of birth, aging, illness and death. He is tormented by the separation from loved ones, the meeting with those he dislikes, and the disappointment of not fulfilling his desires. When he has good luck and is contented with his achievements, he enjoys pleasures of the good time, thus easily indulging himself in the temptations of creature comforts. One idiom reads: “In good fortune lurks calamity.” Once ignorance arises, mental vexations and diseases will torture him. Deluded thoughts of greed, anger and stupidity grow, and his bright true nature is veiled by Karmic obstacles. Good fortune and wisdom will also perish. As his true nature is veiled by ignorance, he unconsciously creates all kinds of negative Karma. When one is able to transform all his afflictions into Bodhi and follow the bright Buddha lights, he can then see the inner lights and achieve the true nature of purity, tranquility and wisdom. In my last letter I mentioned that I had experienced the feeling that both my physical body and everything around it did not exist when I practiced the Maha Cakra Vajra Mantra. It is the true internal realization in Samadhi. May 3 is the Commemoration Day of Cundi Bodhisattva. My sister and I are planning to pay obeisance to Buddha images in a temple. If it is possible, we would like to buy some fish and set them free. I wish you a good health and may everything go well with you. Four years ago, I contracted an eye disease diagnosed as glaucoma by the local hospital. Since then, my eyes have been sensitive to light, and I couldn’t get angry or overtire myself. Since I learned the Cundi Sadhana from you, I have kept on practicing it every day, and with your powerful blessing from many miles away, a miracle happened. A few days ago, I went to an authoritative ophthalmology hospital in the province to have eye examination. To my great joy, the intraocular pressure was normal and I could see clearly again. After only twenty days of practicing the Cundi Sadhana, my eyes became bright, clear and sparkling, and now I even walk with greater vigor. All of my family and friends are surprised to find me a completely changed person. Buddhism is indeed inconceivable! My husband is a salesman. He has a lot of opportunities to meet different kinds of people and can easily be influenced by them. More than ten years have passed, and I have grown more and more disappointed with him. Once a perfect man in my eye, he has changed and now, he is a different person. His shortcomings outnumber his good points. He has become unhealthily skinny, pale and wan. I have lost all of my confidence in him and the sense of security that a woman needs psychologically. For me the only support is my son because he cannot live without a mother. I had begun to despair, thinking that I had come to the end of my life’s journey, with no hope to speak of. Thus, I started to drift along aimlessly. Defiled by a bad environment, I idled away my time and my spiritual life was as blank as a piece of paper. As a result, the members of my family had a lot of complaints about me. My only son, now over ten years old, became more and more unruly, and sometimes he even had the nerve to go against my wishes. I really had nowhere to go to air my grievances. Your loving-kindness and compassion is just like the boundless ocean. After my husband met you and started the practice of Buddhism, he immediately gave up smoking, and he no longer takes alcoholic drinks or eats meat. His face has become lustrous, and he has put on weight. He is vigorous again and happy to find that Buddhism has become his spiritual support in life. Recently, he had dinner with his clients. I was so worried, fearing that with other’s persuasion he would start drinking wine again. When he came back home, he said that he didn’t even touch the wine glass I felt so relieved. In the past, my son had to take care of himself and his studies, so he tended to be lazy in everything that he did. He was not doing well in his studies either. After he had learned the Cundi Sadhana from you, he has become so eager and happy to learn the subjects that he no longer needs me to supervise him. In such a short time, he has made rapid progress in his studies and has twice been chosen as the Three Star Student (Student with Honour for good performance in his studies, keeping school disciplines and doing physical labor). The heavy burden in my mind was unloaded for good. No one can know the joys and sorrows of life unless he experiences them himself. In the past four years, I have been unhappy with my life and job, and I have lived in great misery. Everything and everyone was an eye sore. I was inclined to get irritated easily. But now I feel as if I had been totally cleansed inside and out. I am optimistic and have found my goal in life and now my life has taken on a new meaning. To my eye, the people around me are so amiable and friendly now. Even though I am still quick-tempered, I try to control my emotions, and I don’t lose my temper so easily now. I am amazed to see the great change in myself. My understanding of Buddhist teachings has deepened through practicing the Cundi Sadhana and reading treasured work of Maha Acarya Feng Da An. I’m deeply grateful to Buddhas and Bodhisattvas and to your great kindness and mercy.